Today we celebrate Armed Forces Day! Although our United States Armed Services are divided into multiple branches, we should all take the time to appreciate the unified strength of our Armed Forces. Post World War Two, under the National Security Act of 1947 Congress changed the name of the Department of War to the Department of Defense and restructured the American Military under one Department headed by one Secretary. Now the United States Army, the United States Marine Corp (which was prior under the Department of the Navy), the United States Navy (which had its own department), and the newly minted Air Force are under one single unified department. As part of this, President Harry S. Truman led the effort to establish a single holiday to celebrate all military members for their service rather than the separate “birthday holidays” each branch has. Honoring all of the branches is a critical element of the design of the New Jersey Vietnam Veterans’ Memorial. At the base of our Memorial are flag representing all of the branches which served in Vietnam. 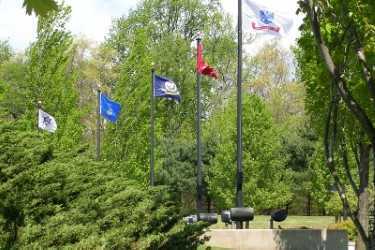 The flags from left to right are the flag of the United States Army, Navy, Marine Corps, Air Force and the Coast Guard. The order of the flags is not by the date of creation but by the casualty total. According, to research complied by the National Archives with the Department of Defense. The Army suffered the most casualties during the Vietnam Era with 38,224. The Marines, 14,884 men, the Navy at 2,559, The Air Force at 2,586. The US Coast Guard has the least number of casualties with 7. The Coast Guard’s involvement in Vietnam is little known. President Johnson called them up for deployment and they served in combat and support positions in the Gulf of Tonkin and beyond.